Who is the Real Richard Doty? The film alleges that a conspiracy existing from the 1950s was formed by members of the military industrial complex to control the federal government with the help of space aliens. The film seems to relate the Kennedy assassination, among other public events, to this scenario. Hastings launched a full-throated assault against Richard Doty, a major source of “Undisclosed,” who he regards as a source of disinformation on behalf of the federal government. Doty is supposed to have been an agent for the Air Force Office of Special Investigations until he retired from the service in 1988. He has been identified as the source of a number of alleged UFO-related top secret documents, including the MJ-12 documents, which many in the UFO community now regard as fraudulent. Doty was also featured in a video entitled “Mirage Men” (3) in which he admits to spreading disinformation about alien invasions that were so fantastic as to beg credulity. The video describes how Doty conveyed false information to a man named Paul Bennewitz, who lived next to an Air Force base in New Mexico. The alleged black ops campaign was so successful that Bennewitz was convinced that he had uncovered an alien conspiracy and subsequently developed psychosis. The idea is that Doty was part of a black ops, psychological war program to discredit the UFO community by spreading lurid stories of alien conspiracies that seem right out of “The X Files.” In this way the secret government cover-up of the existence of aliens, the use of alien technology in American aircraft and spacecraft development, will continue, since anyone revealing the details will not be believed. The problem with this theory is that people who conduct disinformation campaigns are never identified. The old Soviet Union used front groups and friendly journalists who could be counted upon to run fake news and keep their mouths shut about how and where they acquired it. A person like Richard Doty would never identify himself by his real name and affiliation. If, subsequent to his employment by the United States government, he started to spill what he knew, he would either be arrested or have to flee, like Edward Snowden, to a country with no extradition treaty with the United States. In the current era social media, with its anonymity, makes disinformation far easier than during the Cold War. Anyone can put anything on Twitter or Facebook, and a number of people will believe it, especially if it is done through front groups that sound credible. At one point Russian intelligence was running two sides, a white nationalist group and an Antifa-affiliated group, that clashed at a recent protest. So who is Richard Doty? The RationalWiki(4) site identifies him as a former security guard and not a “special agent”, who was involved with two other individuals in a hoax. The hoax that took the UFO community by storm was called Serpo, allegedly about an exchange program in which 12 people were trained by the government to board a UFO and be taken to the alien home planet. 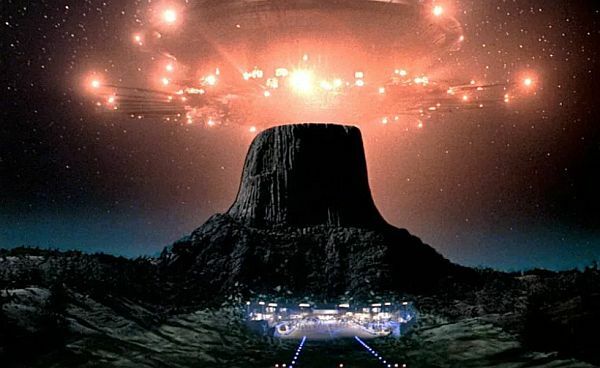 The scenario seems to have been taken right from the end of the classic Steven Spielberg film, “Close Encounters of the Third Kind.” The site suggests that Spielberg may have gotten the idea from Doty, but the timeline of the Serpo hoax does not support this theory. Why would a retired Air Force serviceman, security guard, or special agent, scam the UFO community for the past 40 or so years? Some people are not content to live out their lives in obscurity and crave fame. Hoaxing an entire community about alleged government secrets is certainly one way to gain that notoriety. Top Secret Writers owner Ryan Dube covered Richard Doty and Project Serpo years ago. He also was on the investigative team that exposed Project Serpo as a hoax. I tried reading this twice and my head hurt. His chain of thought has loose links lying all over the floor. Interesting! Jim, I never took you as one who would be in the “Doty-as-government-disinfo-agent” camp. Always considered you a bit more of a skeptic than that. Obviously, you haven’t kept up with current events. The AFOSI has acknowledged on several occasions, including releasing the service records on Doty, that shows Doty was a Special Agent with AFOSI from 1978-1988. This article is poorly written, quoting Hastings, who is a certified liar. Interesting. And I’m sure, “Gene” that it’s not a coincidence that your IP resolves to Grants, New Mexico, where Rick Doty currently lives and works as a police officer. The least you could do is attempt to mask your IP. If Rick Doty was truly an agent of the government, you’d think he’d have at least enough sense to use at least amateur level IP masking technologies before posting on an internet article about him. You have the most inept computer if you trace an IP address to NM. I live in DC. You just can’t seem to answer the question in a logical manner. I have never protected Doty. I’d suggest you check the real me and not make up Fake news about me being Doty. You are a menace to the real UFO community.